Ngobrol Panas - Salju Turun di Gurun Pasir Sahara It is a phenomenon that rarely has the chance to see the world most famous desert. 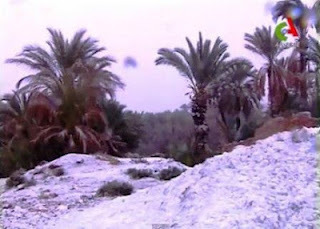 Snow in the Algerian province Besar fell in the mid-week, and are affected by it and some parts of Morocco. Reports speak of the almost surreal scenes, such as palm trees bending under a blizzard and large sand dunes that look like alpine ski resorts. African media to explain storms in the Sahara will result in several positive consequences. In addition to child joy and plague of parasites result in trees, and restoring the groundwater on which depends the survival of the desert oasis. 0 Komentar untuk "[Video] Salju Turun di Gurun Pasir Sahara"